With a motto that starts with "Homeschooling Moms are Busy!" you know you've hit upon a great curriculum choice. Bright Ideas Press strives to create﻿ affordable Christian-orientated curriculum that is designed to fit into your hectic homeschooling day. Bright Ideas Press prays that their products and resources will not only simplify your life but also inspire, encourage, and enable you to effectively educate your children. Many families that I know are familiar with The Mystery of History series that Bright Ideas Press also produces.Most do not realize the amazing science curriculum that come from the same publishers. This user-friendly, unabashedly Christian science materials include teaching lessons, gorgeous coloring pages, hands-on time, review sheets, and an awesome supplemental book list. You can choose from Chemistry, Creation Science, Earth and Space, and Physics. Award winning, college professors-vetted, and parent approved! 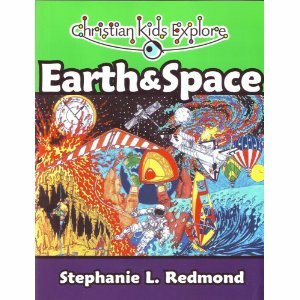 I was given the opportunity to review Christian Kids Explore Earth and Space. Available for $34.95 on the website, this text covers the earth, lithosphere, hydrosphere, atmosphere and weather. Each topic is broken up into manageable chunks, and the 24 lessons presented are expected to take about 30 weeks to complete. An added and optional component to the program is a CD-ROM with all the necessary photocopies on it, offering you an easier way than copying the pages out of the text. This is also available on the website for $7.95. The text is clear and easy to follow. We began by reading a passage that was much like a story or a conversation. Questions would follow that we would answer orally. A coloring sheet was suggested during this time, but we always skipped over it because my kids despise coloring pages. I would also introduce the vocabulary for the unit. A little warning: there is A LOT of vocabulary. My kids never would have been able to make a vocabulary journal for this curriculum. Although I think the idea is a great one and a nice way to learn new words, the amount of writing that would have required on their part would have made it horrible. So I photocopied the glossary and had them find the words and read them out loud instead. A note to my Catholic readers: This series, although strongly Christian, is not specifically Catholic and you will notice differences between beliefs in the text. A little pre-reading is suggested. I found it easy to skim the reading and make mental notes of parts to be sure to point out faith differences to the boys. I try not to skip over these differences as I feel it's important that my kids grow up knowing that not everyone believes the same thing. I enjoy this opportunities to converse with them about these differences. What we enjoyed most about the program were the experiments and hands-on learning. These were easy for me to follow and teach, and used materials that I had little or no problem obtaining. The boys showing off their Earth models and Margaret, who smashed her Earth model into a pancake, pretends to participate. One more bonus about the program is that it was very easy to teach it to different grade-levels. Henry in first-grade was equally as engaged as James in fifth-grade. I had James do more written work for the program, and Henry completed those sections orally or with drawings. I thought making the Earth models were fun. I enjoyed learning about different parts of the volcano. I liked the Earth models because we got to use Play-Doh and I could make a navy one and I named mine the Navy Earth. What I liked about the volcano is how we made the volcano. What I liked about the Earth models was how you made a ball and then you made layers around the ball and then you could cut the ball in half. Disclaimer: As a member of the TOS Homeschool Review Group, I received a free copy of Christian Kids Explore Earth and Space in exchange for an honest review on this blog. I received no other compensation.